A decade ago, we didn’t pay attention to fuel economy and bills at the gas station. Now, when gas price is changing daily (funny, they call it price correction), we need to put fuel economy on our priority list. Unfortunately, as a truck driver, you are familiar with this very well. You need to spend a lot of money to fill in 25 gallons fuel tank of an average full-sized truck. Hopefully, car makers help us a lot. With new technologies and smart solutions used with engine and transmission, it’s possible to have fuel efficient truck that offers high performance as a daily commuter and working horse. So, fuel economy and capability can go hand in hand. Lines below talk about most fuel-efficient trucks, but before we jump to models, MPG data, trim level, and prices let us quickly introduce the most influential factors when it comes to fuel efficiency. To be clear at the very beginning. Fuel Economy is a measure of how far vehicle can travel with one gallon of fuel. It’s measured in miles per gallon (MPG). Opposite to fuel economy is Fuel Consumption that represents the amount of fuel consumed in gallons per 100 miles. 1. The old truck that gave its best – If your truck is produced in late 80’ don’t expect to achieve fuel economy declared by the manufacturer. Old engine with half a million miles or more on the odometer usually means trouble with reliability. 2. Truck size – small and medium-sized trucks usually have better fuel economy the heavy-duty counterparts. Compare Honda Ridgeline and Ford Super Duty. Lighter trucks use less fuel. 3. Engine and transmission – Powertrain suffered significant technological changes over the years. Use of new, light-weight materials for engine components and chassis decreased vehicle weight. Less weight means better fuel economy. To gain better fuel efficiency and power output, Ford developed new gearbox for new full-sized trucks that has 10 automatic speeds. 4. Fuel type – diesel trucks have better fuel economy, period. See the first four spots on our list, and you’ll get it. Read this handful guide to learn differences between diesel and gas trucks, and decide do you need to buy a diesel if you don’t haul and tow big things. 5. Driving habits – driving at inconsistent speeds, rapid acceleration, and speeding decrease truck fuel efficiency. Drive smarter and smoother! 6.	Business or pleasure? If you use the truck as an everyday commuter or lifestyle vehicle you probably can achieve manufacturer declared MPG numbers. In cases, you tow a trailer or haul heavy things don’t be surprised to see much worse fuel efficiency. 7. City or Highway? Constant accelerations and braking in jammed city streets are a real terror for your fuel economy. Constant speed on the highway is much pleasant and fuel friendly environment for any vehicle. 8. Location & weather condition – if you live in sunny California, fuel consumption, due to the optimal temperature, is going to be better compared to those who drive the same truck in cold Duluth, Minnesota. There are undoubtedly even more factors we can add here, like truck upfit, tire profile, maintenance, and other. Don’t forget that numbers you see on the stickers of the truck’s windows reflect the results of a test done by the manufacturer in strictly defined conditions in the laboratory. That are just estimations, and usually, results vary from those achieved in everyday traffic. However, if you drive with fuel efficiency in mind, you can achieve manufacturer results. 2018 Chevrolet Colorado 2WD with CrewCab and the short box is the first on our list; it’s a real champ. Powered by small 2.8L, 4-cylinder Duramax diesel engine with turbocharger, midsized pickup truck from Chevy, has fantastic fuel economy. Making 22 MPG in the city, and 30 MPG in the highway it’s maybe best mpg truck ever. The diesel engine is capable of producing 181 horsepower at 3,400 rpm and 369 lb-ft of torque at 2,000 rpm. New Chevy Colorado CrewCab LT has a net price of $36,280. Another diesel truck on the list. Everything said for Chevy Silverado holds the truth for GMC Canyon. They are equipped with the same engine, same transmission, and chassis. Gross vehicle weight is similar so is fuel economy of 22/30/26 MPG (city/highway/combined). Price is slightly higher compared to Chevy. 2018 GMC Canyon 2WD Crew Cab SLT (short bed) costs $37,090. Whether you choose Chevy or counterpart from General Motors depends on your style and taste. New 3.0L Power Stroke Turbo Diesel engine and 10-speed automatic gearbox are reserved for higher trim levels. The one is Lariat, in a combination of SuperCab and 6-1-2’ box with rear-wheel drive can make 20MPG in the city and 30 MPG in the highway. The engine is rated at 250 horsepower and 440 lb-ft of torque. 10R80 ten speed transmission is developed in cooperation with General Motors. The downside of F-150 in this engine/trim configuration is the whopping price of $46,510. King Ranch and Platinum trim levels cost even more. F-150 SuperCab has 23-gallon gas tank capacity. This means you‘ll need $66.24 to fill in. Other Ford F-150 Lariat fuel tank sizes are: Regular Cab 23 gallons, SuperCrew 26 gallons and an optional gas tank of 36 gallons. Number four on the list and it’s diesel again. 3.0L EcoDiesel V6 engine made from aluminum and graphite iron is like an engineering masterpiece. The engine is rated at 240 HP @ 3,600 rpm and 420 lb-ft of torque at fantastically low 2,000 rpm. The engine is bonded with 8-speed transmission. EPA fuel economy is 27 MPG on the highway and 230 MPG in the city. Maximum towing capacity is 9,290 pounds. Payload capacity is 1,640 lb. If you think this engine is a good fit for your needs, prepare to pay $4,495 over the base price. Moreover, there is an extra cost of $500 for 8-speed transmission. As you can see, most fuel efficient trucks have diesel engines. Honda is the first truck on the list with a gas engine. It seems odd that Honda offers just one engine option for Ridgeline. 3.5L V6 engine paired with the 6-speed automatic gearbox, with manual mode, is capable of offering decent fuel economy for a small truck. Making 19 MPG in the city and 26 MPG on the highway. Models with 4WD have similar fuel efficiency, 18/25 MPG (city/highway). Honda with the mid-sized engine can deliver 280 horsepower at 6000 rpm. Now you can see the main difference between diesel and gas engines. Diesel engine reaches maximum power at low rpm, usually in the range of 3,000 rpm to 3,500 rpm. Starting MSRP for Ridgeline base RT trim is $29,900. 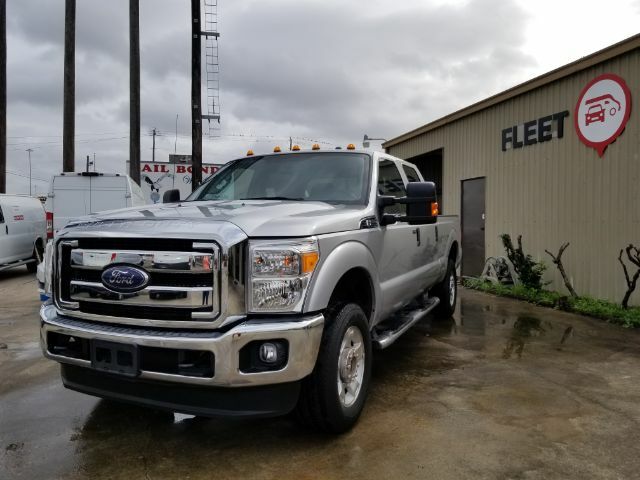 If you just started your search for the truck with best MPG, stop by Fleetworks of Houston Inc at 4815 Katy Freeway, Houston, Texas 77007. We offer used diesel and gas trucks in extraordinary condition, almost like new, at affordable prices. For more information about trucks, cargo vans, and financing call us today at (713)909-7261.